One day last week when I was still at the Mayo Clinic with my Dad, we were eating lunch in the cafeteria when a rather heavyset couple sat down at the other end of our table. Of course, you never know why someone is a Mayo, or even which person in a couple or group of people might be the “patient,” but wandering around you do tend to look at folks and wonder… why is she here? Is it him? All these people are suffering in some way, some more obviously than others. One day I met a woman at the hotel’s laundry machines who explained without prompting that her husband was so ill- with pancreatitis I think it was- that she couldn’t leave him in the room alone very long. As we were talking she got a cell phone call to tell her that her nephew had cancer. Occasionally you would notice someone red-eyed and sniffling into a Kleenex as you sat down in one of the many waiting rooms… what could anyone really say? Or do? Who knows what news they may have just received? And then you see the children with parents heading to an appointment and you just pray they are here for something ridiculously benign, like an inverted hangnail. Now, clearly, I’m no doctor, no nurse, and no dietitian. But it just seems to make a lot of sense to me when Dr. Robert Lustig says that we’re effectively missing the technicolor elephant in the living room when we caution people to watch their salt, watch their fat, watch their alcohol, but rarely if ever do we mention the deleterious effects of sugar, and it’s omnipresence in our contemporary diet. I wished, somehow, I could have communicated that to our table mates that day, and saved them from who knows how many bad salads, not to mention a lifetime of trying to be “good” and wondering why it still isn’t working. I DID finally sit down last night and watched 3/4 of Dr. Lustig’s lecture. He really drives home the point and makes it clear that sugar is toxic. As I have joined in on your no sugar journey, I do my best to cut out sugar and replace it with fruit, smoothies and any other concoction I can come up with to sooth my sweet tooth cravings. But it’s not easy… at all! I grew up on sugar and it feels like I am turning everything upside-down to get it out of my diet. It’s an emotional attachment. It is also challenging to change it because other people take it offensively when you don’t want to eat their baked goods our share an ice cream. Sugar is so acceptable and is even expected to be consumed. I wonder how Dr. Lustig “kicked the habit”. Logically it’s easy to understand that we shouldn’t consume sugar, but it’s much more difficult to do emotionally and socially. But I am forging ahead, right along with you! Mom always says, eat moderately without eliminating the stuff you love because if you do then you kind of focus all your attention on that stuff you deliberately avoided. Id rather have a Coke than a diet one and not keep it in the house but as something to have at a restaurant on the rare occasion we go out. Eve Ogden has always been my magic diet pill because I spend so much time laughing with her that food gets forgotten. I dropped about 10 + pounds after visiting you and Amy.Throw Steve into the mix and I lost another 5. Especially when younger, I was stared at even by celebrities at Mayo because I was the youngest in the room and when I stand when my name is called to see the doctor, they have a look of shock on their faces.They expect one of my parents to be the patient. When I have heard bad news like you had with that woman you met, I have quietly tell the person something to the effect of, “Please forgive me, but I honestly dont know the words that could possibly sound proper at a moment like this. My heart aches for you and I shall be thinking about you and your family.” When King Hussein died at Mayo, I wrote his wife – Queen Noor and she actually replied with thanks for such an honest message. Very interesting Eve. Your thoughts and experiences about the ‘ill effects’ of sugar are well documented. It was only after recently reading a book about the dangers of sugar consumption that I became aware of these effects. The book is “The Sweet Poison Quit Plan How to kick the sugar habit and loose weight” by the Australian author, David Gillespie. He recommends not eating dried fruit as dried fruit contains a substantial amount of fructose in that state and should be avoided as well. He write -for example, that 100grams of raisins contain 31 grams of fructose whereas 31 grams of grapes contain 8.1 grams of fructose. Further, he gives appetising recipes as well. Many of the comments that you make about the poor eating habits of your countrymen apply also to us, here in Australia. I recommend this book to you. I purchased a camera bag some years ago and a little later, a shoulder strap. Both are ‘surviving’ the huge amount of usage they are getting. A well made camera bag surviving the harsh use and sometimes – harsh abuse, that it has to put up with! I am wondering if dried fruit “contains” more fructose because we eat more of it than we would the corresponding amount of fresh fruit? Hmm. I’m not ready to give raisins up just yet!! 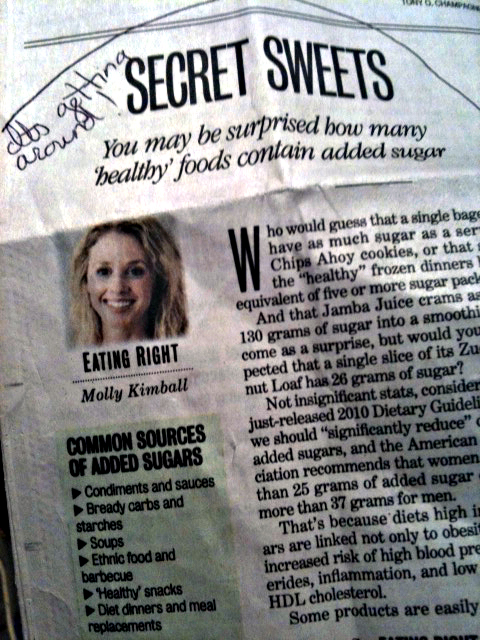 You are currently reading A Year of No Sugar: Post 32 at Eve O. Schaub.